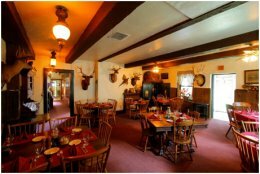 The Westline Inn on 15 E.L. Day Drive in Westline, Pennsylvania was named “the number one coziest restaurant in Pennsylvania” by Travel and Leisure. 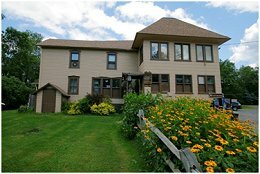 It was built in the late 1800s and provides a unique lodging and dining experience deep within the forestlands of the Pennsylvania Wilds. The Restaurant features fine American and French cuisine served in a rustic yet elegant atmosphere. Start with an appetizer of portabella mushroom ragout with brie, or Shrimp le Jon – fresh shrimp wrapped in bacon, stuffed with horseradish and broiled. Their steak selections are both impressive and very delicious. Choose from a 32 oz. Porterhouse broiled to your pleasure, a 10 oz. Filet Mignon – a most tender, succulent steak, broiled and served with mushrooms, or a Steak Au Poivre – two 5 oz. portions of tenderloin grilled with fresh peppercorns and covered with a smooth brown sauce. Other dinner menu choices include rack of lamb, Maryland crab cakes, crepes Julia and lobster tail. All desserts are created in-house by Chef Julia: ask the server for the day’s delight.